Paula Deen, former Food Network star and documented racist, has landed herself in hot water once again. 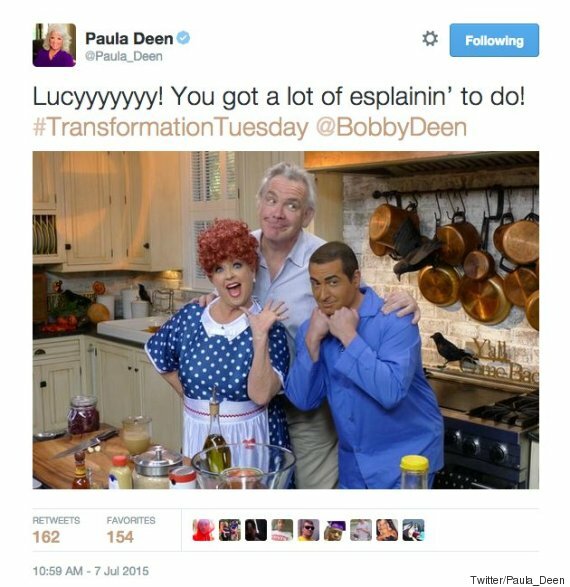 On Tuesday morning, Deen's social media accounts sent out a now deleted tweet and Facebook post with a photo depicting the cook dressed as Lucille Ball's character from the 1950s television sitcom "I Love Lucy." Her son, Bobby Deen, is dressed as the show's Ricky Ricardo, played by Cuban-American Desi Arnaz. The younger Deen is wearing "brownface" to mimic Arnaz's ethnicity. The posts were published shortly before 11 a.m. EDT, and deleted within an hour after several of Deen's followers said the photo was insensitive. The image isn't recent, but comes from a 2011 Halloween-themed episode of "Paula's Best Dishes." A spokesman for Paula Deen told The Huffington Post the picture was erroneously posted by a social media manager associated with Paula Deen Ventures. The individual who posted the photo has since been fired. "Paula immediately had this picture taken down as soon as she saw the post and apologizes to all who were offended,” the spokesman said. "As such, Paula Deen Ventures has terminated their relationship with this Social Media Manager." Deen found herself in a maelstrom of controversy in 2013 after court documents revealed the Southern-born celebrity had used the N-word. She later released a tearful apology on YouTube to ask for forgiveness, but it wasn't enough to save her career. Deen was quickly dropped from major endorsement deals and the Food Network did not renew her contract. At the time, experts predicted the celebrity chef's career was over. But Deen has been trying to stage a comeback ever since, launching the Paula Deen Network, an online platform for cooking and lifestyle programming last September. Only time will tell if the latest snafu will impact her loyal following. This article was updated after publication to include a comment from Deen's spokesman. At least one Food Network star is <a href="https://www.facebook.com/ChefMcCargoJr" target="_blank">coming to Deen's defense</a>.